We have all heard the expression ‘the score wasn’t a true reflection of the game’ and this game was certainly a case in point. As the spectators said ‘it was the game that got away’. Reeds started with 14, a late arrival started 5 minutes into the game. The team was mainly B players with a supplement of As, playing their 1st game together. Haslemere were a well drilled settled team, especially the pack playing on a very narrow pitch. Haslemere exploited their pitch to good effect, more power to them, while Reeds never truly came to terms with it. Haslemere had obviously played several games together. The 1st ten minutes saw Haslemere camp inside the Reeds 22 and generally pound the line. The defence was good and turned back every attack. As the Reeds’ pack got used to each other the defending became easier. A penalty allowed a good clearance into their half, followed by a clean line-out and forward drive. For the next 25 minutes Haslemere entered Reeds’ territory twice, neither time threatening. Midway through the half, Isaac playing his 1st game at No 8 picked up the ball from a driving maul and scored in the corner. The conversion was missed but it looked like a pattern had been set. 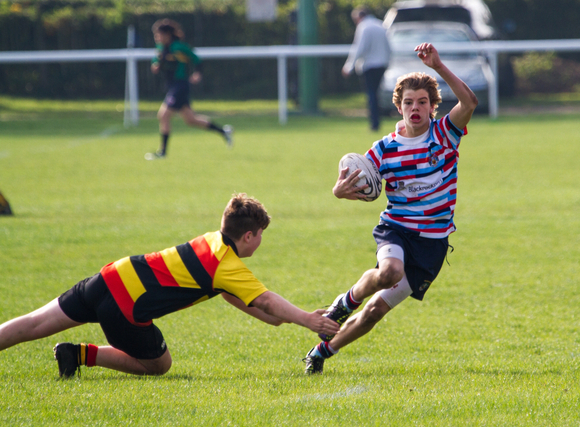 The B forwards were ably marshalled by Callum and Ross, who’s tackling was particularly hard and bone shattering. The Haslemere pack were heavier and on a rain soaked pitch with little purchase were to drive the maul back, the sign of a scratch pack against a settled pack. The referee allowed for the conditions, sometimes a bit to generously. He allowed players to dive into rucks and/or come off their feet, only 1 penalty given all match. Even with the disadvantages Reed won their share of ball, snuffled any Haslemere attacks, normally at source and gave the backs good ball. Good out of hand kicking keep Reeds in the Haslemere 22. Unfortunately the last pass was often dropped. Haslemere were kept in the game by dropped ball and the odd over enthusiastic penalty. The true pattern had been set and as Reeds reached half-time they only lead 5-0. A number of players were out of position, Issac, Callum and Max for example. Olly T manfully played the 1st half on the wing, then played fullback, he became the go to man for any position. The pack was slowly being out-muscled and in the 2nd half faced a slight uphill slant. The 2nd half started as the 1st half ended, the pack stormed into the Haslemere 22 and took up residency. As with the 1st half dropped ball was a problem. Reeds’ dropped 3 balls near or over the line while Haslemere cleared with long raking kicks easily run back by the backs. The narrow pitch took its affect as expensive back play was limited. Haslemere passed down their line once, one winger never touched the ball in open play. At about 15 minutes into the 2nd half a player arrived (no names to protect the innocent) which proved very fortuitously. At that moment Haslemere kicked deep, Marcus dived on the ball saving a try but was injured in the process. Reeds had a substitute but were sad to see Marcus leave the pitch as he was having a good game with both ball in hand and his tackling. A dubious penalty awarded and a 10 yards loss for talking back and Reeds were in their 22. Haslemere took the scrum and scored close in to the posts, easy conversion. The try was totally against the run of play. Reeds took up the attack with the backs spinning the ball with effect. Ross &Callum were punching the holes but the break didn’t happen. With Marcus off, Lewis went to the wing from the pack, more power but less speed. Again the narrow pitch kicked in and last ditch tackling by Haslemere prevented 2 tries in the corner. Where was Usain Bolt when you needed him. The last 5 minutes were played in Reeds’ territory after another long penalty kick. Haslemere had 4 drives for the line, all repulsed, the referee on the blind side missed a knock-on on the open side, saw the player over the line with the ball and gave the try. The game was up. Time had run out. The game was always tense with the B’s acquitting themselves well. The loss of early season games and injured players such as Omarie hit them hard. For a scratch team the result was admirable and a game well worth watching. As Tim/John would say plenty of positives, a few negatives to iron out at training but overall a very satisfying day.